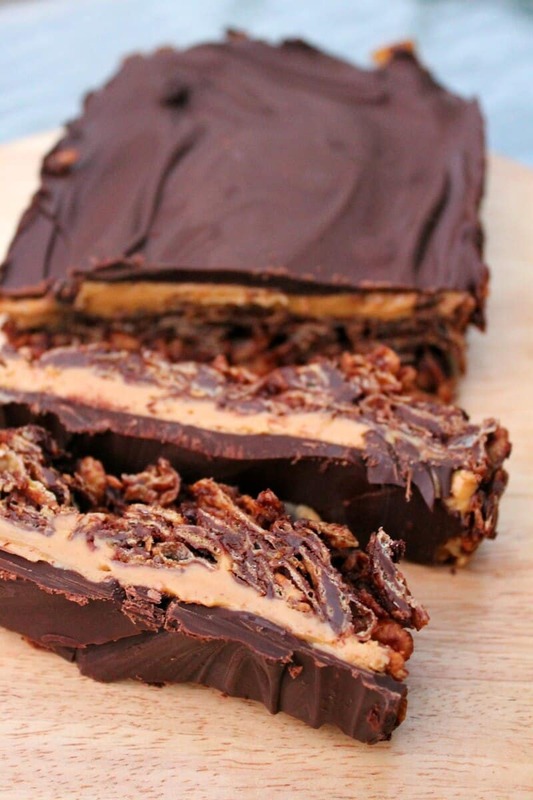 Ready for a slice of chocolate peanut butter cornflake slice? As you can see, my healthy eating post-holiday is going well! It was definitely time for a treat. No baking needed, just some time to chill the layers, and you can help yourself to a slice of this. You don’t need any fancy equipment, just a tray of some kind to make it in (I used a loaf tin) and bowls for melting and stirring. A yummy treat for the kids before they go back to school perhaps? Or for yourself if you are anything like me. It isn’t difficult, it is just full of chocolate peanut butter goodness. Start with a layer of cornflakes and chocolate as if you were making chocolate cornflake cakes. Let it chill in the fridge. 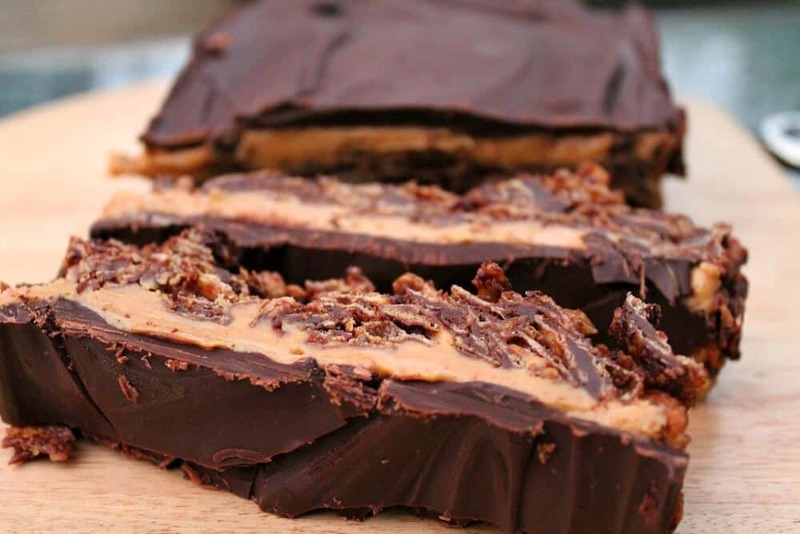 Top with a layer of peanut butter – sweetened up a little of course! Allow to set again, then top with melted dark chocolate. And there you have it, a whole lot of yumminess you need to slice up straight away and share out. Baking is fun but no-bakes are great for when you want something simple. it is rich and indulgent but just so easy and straightforward. 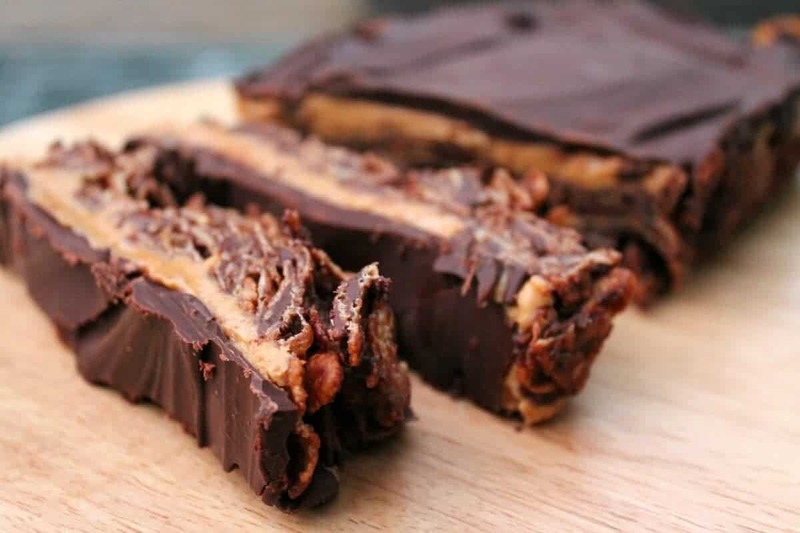 Bite through the top layer of chocolate to the creamy peanut butter beneath, and then reach the chewy cornflake layer at the bottom. A load of textures and a load of calories, clearly! I just love the rich colour of the peanut butter. That creamy layer just makes this cornflake slice a bit more exciting! Keep it in the fridge if it is warm weather to keep it at its best. See if you can stop at one slice. I find that a bit of a challenge. Get the recipe below. Check out my cake archives for more indulgence, including a few other No-Bake recipes (such as fudge!). I’m just going to try and stop myself eating another slice, wish me luck. 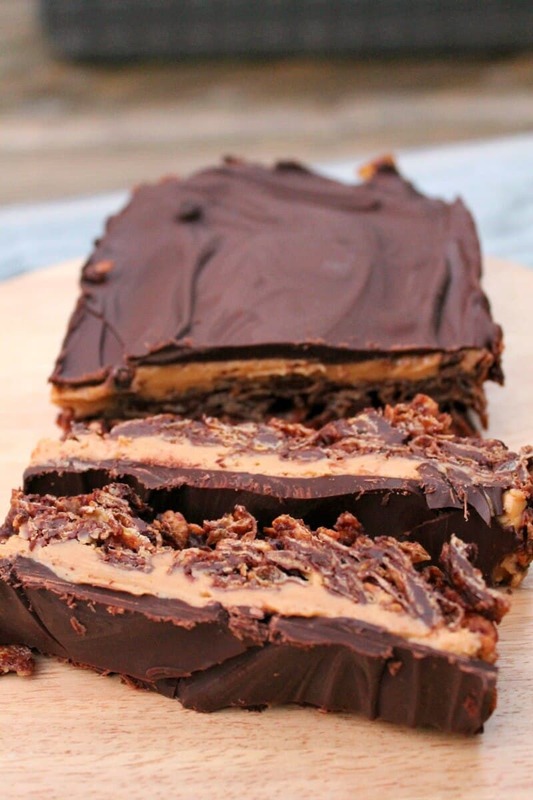 Pin my chocolate peanut butter cornflake slice for later!! Mix together the first 180 g of chocolate and golden syrup. Melt together gently. Place the cornflakes in a large bowl and pour the melted chocolate/syrup over them. Mix to combine thoroughtly. Spread the cornflakes in the base of a large loaf tin (lined). Press down well to form a solid base layer. Chill in fridge until set. Gently heat the peanut butter in a bowl (I used the microwave, 1 minute at 600 W) and stir in the icing sugar. Pour it over the chilled chocolate cornflake mixture and spread evenly to form the second layer. Chill in fridge. 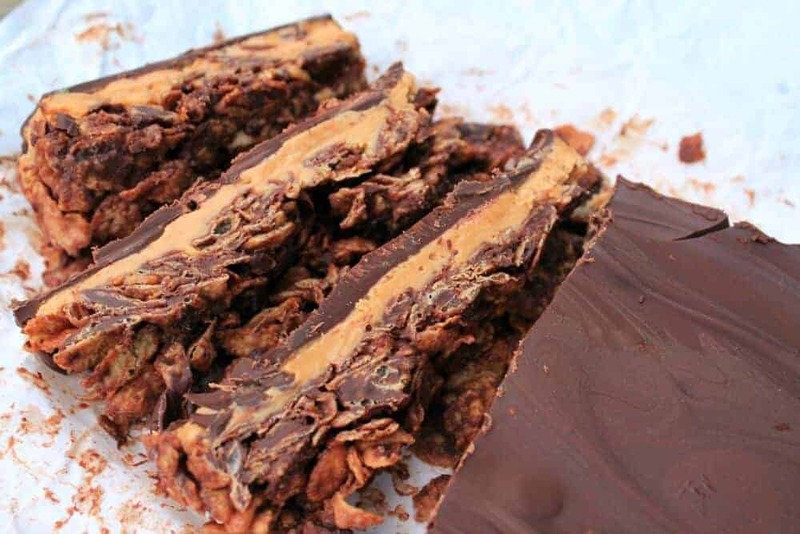 Melt the second lot of chocolate and pour over the chilled peanut butter/cornflake slice. Spread evenly. Chill in fridge until set. Cut into slices to serve. Sending this over to We Should Cocoa with Choclette from Tin and Thyme, check it out for lots of recipes using chocolate. its an ingredient used in the UK, sugar based. If you let me know where you are based I would be happy to look up an alternative for you! Can I used honey instead? Not sure which ingredient you wanted to replace with honey? How I convert this gr into a cup? Hi Gaby you’d need to use an online converter. Love the recipe – although I forgot the icing sugar. Does this matter? No the peanut butter just won’t be sweetened but there isn’t much icing sugar anyway so it won’t be too different. Hope you enjoy it! Could you convert the recipe to English measurements? These are English measurements Ina, I’m English! Could you use maple syrup in place of golden syrup? Ooh I don’t know Jenny if that would work. Golden syrup helps the chocolate to harden and I’m not sure if maple would do the same. I don’t see why not, rice krispies might work well too! Oh yum this looks so tempting! I would definitely enjoy it. I just love how full of peanut butter and chocolate it is. This looks so delicious, such great flavours and textures, pinning for later. Thanks very much Janice, haven’t baked with chocolate for ages and this was the result! Oh my, these look amazing Lucy. Chocolate and peanut butter are a match made in heaven and chocolate cornflake cakes are one of my favourites. What a fantastic combination. Thanks Choclette, they are disappearing fast here!